W(e)aving Tower is the proposal that won the most recent Color in Architecture competition, organized by AkzoNobel and Archisearch.gr. The winning proposal redefines the interaction of Greek cities with sunlight, and the relationship between each residence and its cantilever-balcony, in essence offering an upgrade, both aesthetic and energy-wise, of the existing building mass that dominates the urban landscape. 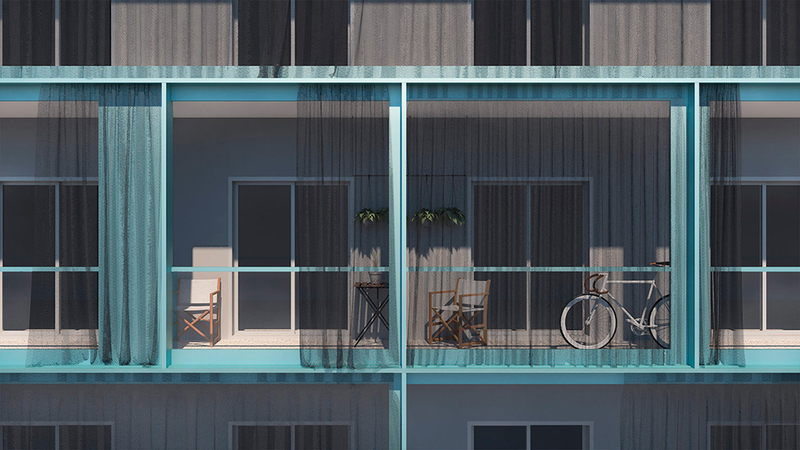 The typical fabric awning that is so commonly found on balconies of Greek apartment buildings is replaced by a perforated metal curtain, which slides along a metal frame attached to the building’s facade. 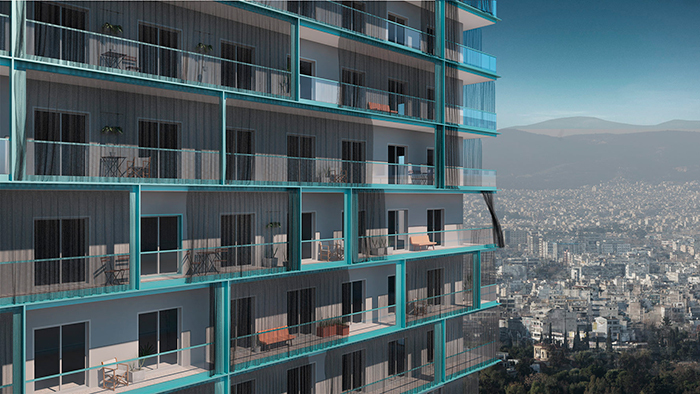 The proposal will be implemented on the Apollon tower, the tallest residential structure in Greece, a project by Ioannis Vikelas. The repetition of the floors combined with the large surface area of the exteriors requires careful and strategic handling in the development of the new facade, both in regards to the building’s eventual appearance and in regards to energy efficiency. The project introduces us to a new urban structure, which is intended to improve ventilation and shading conditions in the interiors of the residences, as it permits the light to reveal different guises of the residence over the course of the day. Based on the study, the north-facing exteriors remain bare, while on the west-facing facades fixed metal curtains are attached, fastened at the top and bottom on a rail. The metal curtains extend over more than one floor and essentially function as fixed sunshields. On the facades facing south and east, the curtains move freely and it is up to the residents to use them as they see fit. The metal curtains are perforated with diamond patterns of varying density, so the resulting image is not fixed and uniform. This gesture of the exterior curtain that traverses the building at intervals and surrounds the balcony of each residence redefines the relationship between in and out; each aspect changes as the trace of the residents’ activities is projected on it. An interactive set design game, changing what we call the urban landscape.